They are the last three days of a dismal summer and we are in Melbourne living a lesson in style at the zany boutique hotel, The Cullen. It is one of the new Art Series hotels, strategically placed on Commercial Road, Prahran, opposite the famous market and a block from fashionable Chapel Street. However, the hotel itself is a delightful artful accommodation experience dedicated to works of the eccentric Australian artist, Archibald Prize winner Adam Cullen. His irreverent works plaster the walls of our contemporary hotel room, (those that are not mirrored) and even the frosted glass walls of the en-suite are etched with his extraordinary depiction of Phar Lap with lush eyelashes. Everything about the hotel is a statement of style. 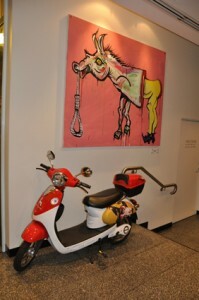 The foyer is a riot of eccentricity with two motor scooters and two red bicycles painted with Cullen’s signature portrait of his dog, Growler. Then there are the two life-sized cows – one of which is covered in blue mosaics, the other decorated with graffiti. Adam Cullen earned the tag “enfant terrible’’ in art school and was already renowned as a Sydney grunge artist when he won the controversial Archibald Prize for his portrait of actor David Wenham in 2000. He also illustrated Mark (Chopper) Reid’s book. However, behind the bad boy image, his works have brilliant elements reminiscent of Salvador Dali. Ours is a studio apartment slick and modern with black curtains, dark grey carpet and a grey lounge with orange soft furnishing highlights. Ned Kelly is on one wall and on another is Lady Luck 2002 reflecting a strong social issues statement about men’s attitude towards women. It’s a fabulous artwork of a bikini-clad blonde girl winking as she sits in a champagne glass and alongside a wicked, lustful fox/man hellbent on carnal intent!. “I know these crushed people because I grew up noticing them,’’ says Adam in a book by Ingrid Periz in his biography Scars Last Longer. Edmund Capon director of the Art Gallery of NSW commented on Cullen’s mid-career survey show in 2008 and wrote of his “inherent disobedience” in the catalogue foreword. 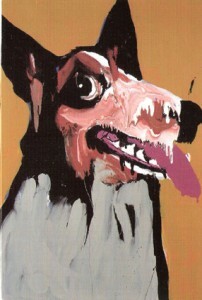 But others describe his works as crude, distasteful and grotesque. Yet, we are surprised at how uplifting and inspiring artworks can be, even when they are repulsive, even demonic to the eye. They also enliven our living environment if only for three days and triggered much conversation about art and life.